Do you live in, or have a business in Chatham that needs the service of a self storage company? Lok'nStore has a facility in Gillingham just 15 minutes away from your location in Chatham. 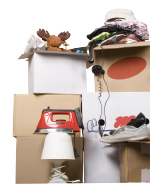 We can provide you with low cost storage space in a range of different sizes, from 1 week or for as long as you need it. Call Lok'nStore Gillingham for more help and if you book and mention this page you will receive two free medium boxes.